Trucks removing staging materials from Upper Hutchinson Field last month. 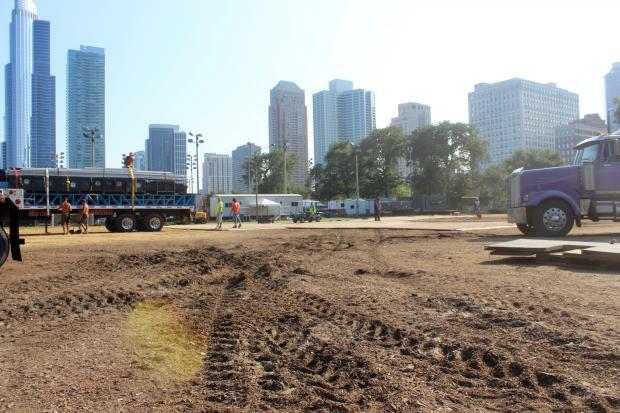 DOWNTOWN — The tab to repair Grant Park after an extra-long Lollapalooza is way up from last year, or any year since 2011. Repairs this year will cost $453,000, according to the Chicago Park District. That's nearly double the $236,000 it took to clean up Grant Park last year, and more than the $350,000 spent in 2012 to repair Grant Park after big storms turned Hutchinson Field into a mud pit that had to be completely replaced. The sum is still well less than the $1 million spent to re-sod all of Grant Park in 2011. Jessica Maxey-Faulkner, a spokeswoman for the park district, did not immediately address the reason for the increased cost. The big tab is a surprise after early signs showed less wear on Grant Park in the wake of the big music festival, which added a fourth day this year. The park's lawns only required re-seeding and other minor improvements, and no portions of the park were closed for an extended time. But heavy rains late last month washed away seed, delaying restoration, according to Bob O'Neill, president of the Grant Park Conservancy. But O'Neill says "if you go out there now" the park "looks really good." "The increase in costs means to me a better restoration," he said. Like prior years, the cleanup bill will be footed by C3 Presents, Lolla's promoter. Brittany Pierce, a C3 spokeswoman, said in a statement that "severe weather experienced during the build, along with rain during first two days of the festival increased the remediation cost for 2016." Lolla will return to Chicago with another four-day festival next year. More than 100,000 people daily attend the festival, which is under contract to stay in Chicago through 2021.